Background: In 2004, The World March of Women, an international network of 6,000 grassroots women's organizations, created a global charter calling on men, women and oppressed groups across the planet to live together with "equality, peace, freedom, solidarity and justice." It's a compelling vision of an ideal world. But what do these abstract goals look like for everyday women? 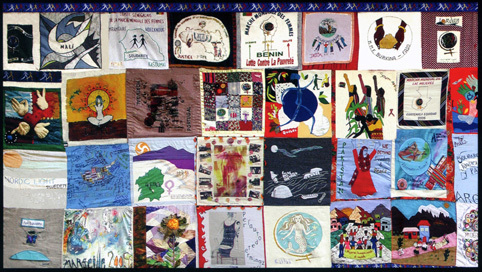 The answer was the women's solidarity quilt, a colorful patchwork of women's hopes and promises for a better world. The quilt passed from country to country around the globe. At each stop, the local women stitched together a quilt patch to represent their country and illustrate the values of the charter.  large sheet, or sheets, of heavy paper such as tag board paper about 24 x18 inches.  one paper drawing square for each student. (use sturdy paper of any size you want).  art supplies for drawing. Read background information to whole class. Give each student one square to illustrate. The square should reflect the students ideas about the selected topic. Student creations can be abstract using symbols, or words (slogans), or colors. In an art class, students might create a quilt that holds together with a unifying design, deciding on color schemes and a border.  different types of paper such as: tissue, sandpaper, glossy paper for students to use in their images.  a long sheet of wax paper and only tissue shapes to make a window quilt for the sun to shine through.  white material squares and fabric crayons, or paper squares.  pastels to create the squares. Hairspray finished product so that the pastels will not smudge. Students describe what their pictures are about. Class decides how to arrange the squares so that the quilt either makes a good design or tells an interesting story.  piece the quilt by gluing the squares onto a large construction paper backing. More than one quilt might be needed.  hang for all to see.  punch two holes on sides of each square and connect them with ribbons.  hang the student artwork edge to edge creating a class size border.  draw simulated stitching on with markers. Or, outline the patchwork squares using black crayon or markers.